Madeira Park, BC: Douglas & McIntyre, c2016. This is a lovely, thoughtful book made up of musings and meditations by writer Richard Wagamese. His former blog was full of these kind of intimate pieces that I always enjoyed reading for their eye on the world. So I was happy to see this new book. It is a small book, with beautiful full-colour photos throughout. There are many pages that have an image and a quote in fancy font, which look like they might fit right in on Instagram or Pinterest. And yet, this is more than a fluffy visual treat. 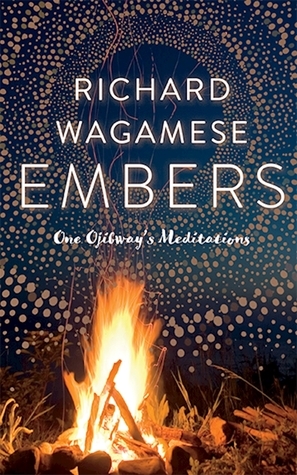 Wagamese is a deeply spiritual writer, and he values silence and ceremony as a way of life. This is what centres him and brings his art to life. I deeply resonate with this, feeling that more silence and stillness would be very welcome right now. I could quote a lot of different passages to illustrate what I loved about this book. There are dialogues with "Old woman" about Creator and the meaning of life; there are appreciations of natural beauty and the small daily joys found in nature. None are more than a page long. This was a great read following on from my recent spate of poetry reading -- these small pieces feel poetic, feel like expressions of attention to the world. They are statements that stand alone, but that track Wagamese's spiritual journey, that are an expression of his personal pondering along the way. It's the kind of book that you can read slowly, page by page, or just flip through and admire the very nicely put together physical book, returning to read beyond just the quotes a little later. Here are a few excerpts I found particularly meaningful in our current situation. Me: What if we're wrong? Old Woman: Can you think of a better way to live than in gratitude? Can you think of a better way to be than to be kind, loving, compassionate, respectful, courageous, truthful and forgiving? Even if we're wrong, can you think of a better way to breathe than through all of that? You can't test your courage timidly. You have to run through the fire, arms waving, legs pumping and heart beating wildly with the effort of reclaiming something vital, lost, laid aside or just plain forgotten. When you do that, you discover that we shine most brightly in community, the whole bedraggled, worn, frayed and tattered lot of us, bound together forever by a shared courage, a family forged in the heat of earnest struggle. Me: What's the greatest teaching in life? Old Woman: You have to make your own moccasins. Old Woman: No. You make them from the hide of your experience, all the places you have walked. You sew them with the thread of the teachings, the lessons embedded in all the hard miles. You stitch them carefully with the needle of your intention -- to walk a spiritual path -- and when you're finished, you realize that Creator lives in the stitches. That's what helps you walk more gracefully. I got busy learning how to sew. As you can tell, this is a highly quotable book. I read this copy from the library, but I'm pretty sure this is a volume I'm going to want to own. For Wagamese's take on life and spirituality, drawn from his absolutely focused desire to live in harmony with Creator, I recommend you also check out this book. Hmm. Interesting. I really enjoyed a collection of his NF (which was probably pulled from the blog you mention) and I was wondering about this one when I saw it in your pile; I'm not entirely sure, but curious enough to give it a try! It's like Wagamese lite... short pieces and pretty images. Great for social media readers. His longer pieces are obviously more complex, but I still did enjoy the presentation of this book. This sounds like a truly wonderful book, Melwyk. Lovely and thoughtful post, as always! I thought this was a wonderful read. Very visually pleasing and thoughtful too.